Autoxloo offers dealers a professional platform for effective live presentation and promotion of your inventory online. With Autoxloo’s Showcase Tools you can give your vehicles and dealership impressive look, expert design and competitive advantage. You can advertise your brand on your own without any external management. Our Showcase Tools are a good basis for the best positioning of your vehicles on the Internet. Make your graphical content outstanding and memorable with our Multimedia Tools. Show the best sides of your vehicles by using Autoxloo’s Vehicle Showcase Tools. 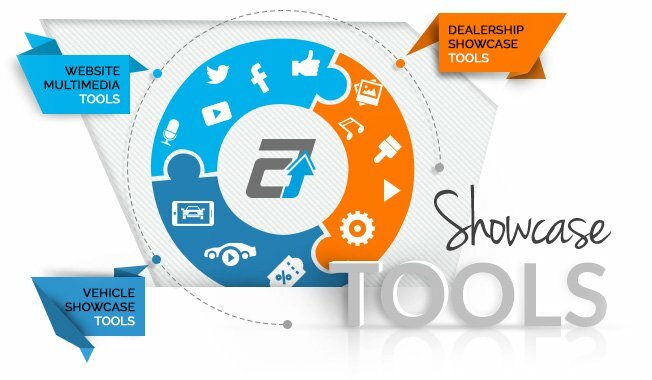 Present your dealership, its services and products with Dealership Showcase Tools. Take advantage of the latest achievements in the automotive industry! Videos, photos, graphics, customer testimonials, video commercials, animation, and full motion video – all media components attract customers’ attention more than thousand words. With our Website Multimedia Tools you can create, edit and manage your media content without any designer’s or programmer’s help. Strike your customers, arouse their interest and make them remember your brand by creating rich, effective, catching, and live content. All successful, quick and easy sales can’t go without a good online presentation of your vehicles. Leave Photoshop, Paint or other tools behind and use Autoxloo’s Vehicle Showcase Tools to give your inventory a desired look. Detailed descriptions, professional images, and a correct delivery of your vehicles’ best features will help you get more traffic, conversions, and sales. With Autoxloo’s Dealership Showcase Tools you can advertise, showcase and present your dealership the way you like. Make videos and upload them on YouTube. Add slideshow banners, attach video testimonials, put the background music and many more. Create an exclusive image of your dealership with the most effective and reliable tools.